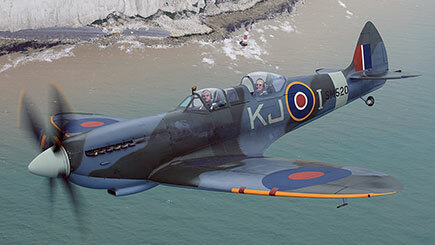 For the first time in UK history, experience the unique thrill of a breathtaking passenger flight in a Spitfire TR9. Originally used by the RAF to train Second World War pilots, there are just eight of these stunning two-seater aircraft left operational in the world. Hear the Rolls-Royce Merlin engine roar into life as you prepare to take to the skies for a 20 minute round trip over the coast of the English Channel, the location of so many wartime airborne fights. Witness the Spitfire's famous elliptical wing passing over England's green and pleasant land and marvel at the power, manoeuvrability and grace of this iconic warbird which is now over 70 years old. This is an exceptional chance to enjoy a truly unforgettable high flying experience. Flights are available on Tuesdays, Wednesdays and Thursdays between April and October. Minimum age is 18. Minimum height is 4' 7''. Maximum height is 6' 3''. Maximum weight is 17 stone. Flying is a weather dependent activity. If the flight is cancelled because of weather, an alternative date will be rebooked. Spend around 30 minutes in the Spitfire, with a 20 minute flight. The full experience lasts up to five and a half hours, including a briefing and training at this fantastic flying academy. Held on a one-to-one basis with a seasoned flying instructor. Dress comfortably in flat-soled shoes and bring your sunglasses. A flight suit is provided. Regrettably, cameras aren't allowed in the cockpit but you can buy a DVD of the flight for £180 (on the day). Before doing this experience you must read the Risk Information Form which can be downloaded below.